Finance Minister Joe Ceci broke past practice Tuesday by suggesting government would like public sector unions like AUPE to accept no salary increases in their current contract talks. 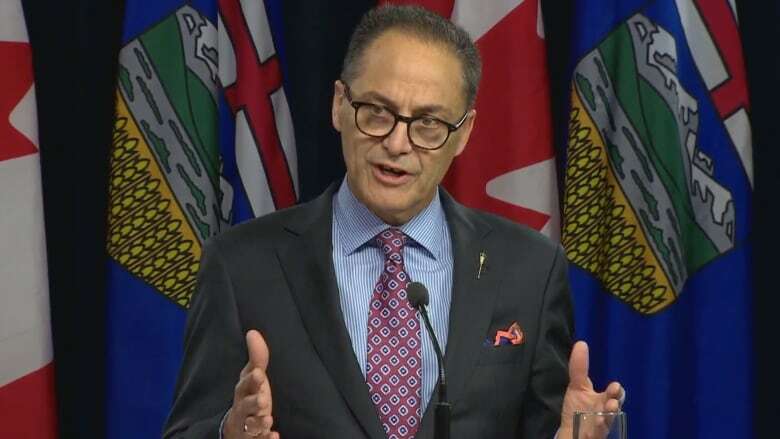 Finance Minister Joe Ceci broke past practice Tuesday by suggesting the government would like its public sector unions — such as the Alberta Union of Provincial Employees — to accept a wage freeze in current contract talks. Ceci pointed to the two-year deal reached in April with the Alberta Teachers' Association, which had no salary increases over two years. "The teachers' negotiation is what I really hope will be achieved in other negotiations," Ceci said during a news conference at the Alberta legislature. "That's what my hope is ... that people will see the benefit of long-term job stability and the fact that there are no raises, they'll have their ongoing jobs," he said. "That's what I hope will occur in negotiations throughout the other contracts." In the past, Ceci has declined to say what he hoped would come out of public sector contract talks, saying he didn't want to negotiate through the media. In addition to AUPE, which has more than 90,000 members, the government is also in talks with the Health Sciences Association of Alberta and the United Nurses of Alberta. Ceci said the comments were not an attempt to intervene in contract talks. Though he referenced job stability, he said he wasn't suggesting a refusal to accept zero increases would translate into job cuts. The teachers agreement contains a so-called "me too" clause, which means that if the government negotiates a salary increase with another union, the teachers would automatically receive the same increase. In addition to announcing his expectation for contract talks, Ceci said the government is extending the salary freeze for management and non-union employees to Sept. 30, 2019. That applies to both the Alberta government and agencies, boards and commissions. The size of the civil service will be frozen, mostly through attrition, but excluded from the hiring freeze are frontline education and health care positions, Ceci said. Ceci's remarks raised the ire of AUPE president Guy Smith, who said the hiring freeze is affecting front-line services in a growing province and will end up costing the government more due to overtime and employee burnout. As for Ceci's suggestion about zero salary increases, Smith suggested the government was breaking a commitment not to negotiate in public. "It damages the relationship we have at the table, because those discussions take place in confidence," he said. "And, with due respect, it doesn't help when statements are made to the media that impact collective bargaining." Ceci made his remarks during a news conference about the Alberta government's second-quarter fiscal update. Citing a robust economic recovery, the province is now projecting the province's gross domestic product will increase by four per cent in the current fiscal year. The 2017-18 budget, tabled in March, forecast GDP growth would be 2.6 per cent. While the economy appears to be rolling along, Alberta Finance officials said Tuesday that GDP will moderate to 2.5 per cent in the next fiscal year, 2018-19. For the first time, the government is offering information to back its claims of what it calls "in-year savings" — about $400 million in cuts it plans to make above and beyond what was laid out in the budget. So far, $314 million has been trimmed, due to reductions in travel, hospitality and supplies, deferral of spending on capital projects due to delays in matching federal funds, and lower demand for programs like apprenticeship training grants. Although the price of a barrel of West Texas Intermediate crude is currently $58 US, the government is sticking with the $49 benchmark it moved to in the last quarter until the higher price becomes a longer-term trend. The unemployment rate is still forecast at eight per cent, but the government said two-thirds of the 62,000 jobs lost during the recession have come back. Of that amount, 21,000 are full-time in the private sector and 11,000 in the public sector. Another 9,000 jobs come from people who are self-employed. The deficit is currently forecast at $10.3 billion, a slight improvement of the $10.5 billion forecast in the first-quarter update. Opposition politicians said the update still has a lot of bad news. United Conservative Party finance critic Drew Barnes said the NDP doesn't have a plan for returning to balanced budgets and getting spending in line. "Getting back to balance a hundred million at a time will take hundreds of years," Barnes said. When pushed about how his party would cut spending, Barnes was vague beyond making "systemic changes" to infrastructure spending and returning to local decision-making on health care. He said UCP members would discuss those issues at the party's policy convention in May. Alberta Party caucus leader Greg Clark said both the NDP and UCP are being unrealistic. "They both rely on the the price of oil going up to fix the problems that face Alberta," he said. "Which is what we've been doing in this province for 40-plus years." Clark didn't rule out the idea of introducing a provincial sales tax, though the Alberta Party is officially against one. He said Alberta must first decide if government services are being delivered efficiently. Then government needs to decide how to best stop being so dependent on oil revenues. "Is the tax mix we have in Alberta right now the right one? Probably not," Clark said. If Alberta wants to reduce taxes to encourage investment, then there has to be another way to make up that drop in revenue, he said. "It leads us to a conversation about a consumption tax," Clark said. "There's no way around that."